In 16-22 March participated in Novruz Festival in Baku (Azerbaijan). Festival was celebration of Novruz Bayram (21.03)- the begining of Spring. 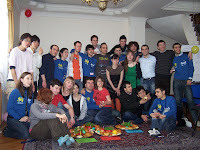 Festival was organized by AEGEE-Baki group. I took part in traditional treasure hunt, azerbaijani dance course and in traditional novruz dinner with azerbaijani family! Beside that I could visit Mardakan Qalasi (fortress), Atashgah (Fire temple), Qobustan and (the most exciting for me!) mud volcanoes. More information about Novruz Festival you can find in presentations below (presentations was prepered by AEGEE-Baki). Visit on Festival gave me also chance to meet great friends from different countries! View more presentations from pirveli.